TP-Link TL-WR841ND Wireless Router. Status Page, originally uploaded by v.plessky. I bought this router to upgrade my Home LAN to 300Mbps 802.11n. And to study in details design of modern wireless router based on Atheros chipset. 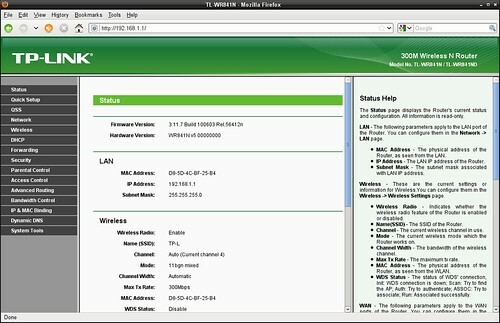 After "playing" with standard firmware provided by TP-Link, I plan to flash it with OpenWRT firmware, or other Open Source firmware/Embedded Linux. Purpose of this post (and photos on Flickr) is to make short review of router "as it is", and make snapshots how User Interface looks. Such kind of device is also known as Internet Gateway Device (IGD), or Residential Gateway, as its typical usage scenario is to provide Internet connectivity for several (up to hundred) users - PC Desktop, Mac, Laptop, Smartphone, Game Console, Media Server, etc., using just one IP address from ISP. - IEEE 802.11n standard with wireless transmission speeds of up to 300Mbit. - Two External Detachable Antennas for better wireless performance, transmission rates, stability and coverage. - CCA technology automatically avoids channel conflicts using its channel selection feature. - Universal Plug and Play support allows UPnP-enabled programs (like BitTorrent, KTorrent) to open ports on router automatically. You don't need to do Port Forwarding manually if you use UPnP. Pentoo Linux: WEP key found! Slitaz Linux: WEP key found!